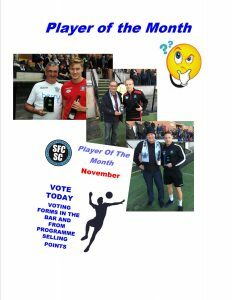 Last day to vote for your Player of the Month. Been some great performances from the players during November. Been tough games during November with the top two teams, FA Trophy and League Cup. Vote today, collect your slips from the programme seller points or from the Supporters Club Table in the Sarum Suite.